This certificate enabled him to pursue a teaching qualification at Adams Teacher Training College (later renamed Amanzimtoti Zulu Training School) where the history of European modern art was part of the school curriculum. The arrival in 1967 of Innocent Masondo, a former Ndaleni Art School graduate, was a blessing to Sibisi. As a new teacher, Masondo recognised Sibisi’s artistic talent and referred him to the principal. Subsequently, he secured the Department of Bantu Education bursary, which helped him to enrol at Ndaleni Teacher Training School in Richmond. 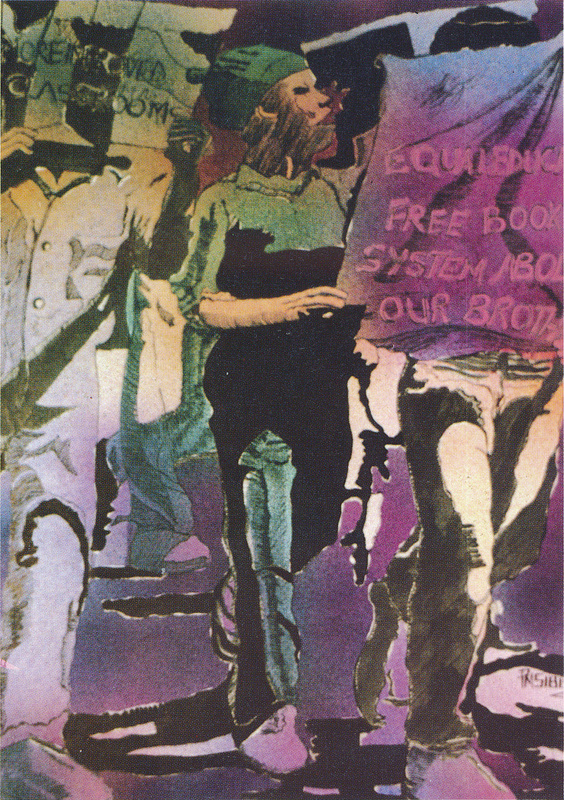 At the end of 1968, he was referred to Jo Thorpe of the South African Institute of Race Relations (SAIRR) in Durban who, through the African Art Centre, was to play a central role in his life and career as an artist. 1969 saw Sibisi employed as an art teacher at the Applesbosch Girls’ Training College in Ozwatini. During one of his visits to the office of Thorpe, he came across the etchings of Cyprian Shilakoe, which stoked his curiosity. Thorpe helped him to obtain a SAIRR bursary to study art at the Rorke’s Drift Centre. He prematurely resigned at Applesbosch at the end of 1971 but spent the better part of 1972 teaching at the local Ndongeni Primary School whilst waiting to go to Rorke’s Drift the following year. During this time his art explored the daily human and personal experiences of living. This is apparent in his 1972 black ink drawing, People I Meet. The composition depicts vibrant figures, which are expressive of his personal travels in search of educational opportunities. The same year he made another brush and ink drawing of two tangled figures with closed eyes and Dumile Feni-inspired limbs titled Introspection l. The work calls to mind the loneliness that often comes with the energy-sapping challenges of being an artist. The close of 1972 saw Sibisi resigning at Ndongeni to pursue his artistic practice at Rorke’s Drift. At the art school, Sibisi made friends with Thami Mnyele who introduced him to the philosophy of Black Consciousness and the power of books to develop his intellectual capacities. 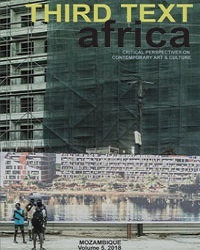 Reading authors such as Frantz Fanon, Casey Motsisi, Can Themba as well as Staffrider, the literary and arts magazine heightened his political consciousness. He began to grapple with how art could express his identity and immediate circumstances. Unfortunately, Sibisi could not complete the 1974 educational year and Mnyele went into exile around the same time. Sibisi spent the coming three years from 1975 teaching at KwaThambo Combined School in KwaMakhutha, Amanzimtoti. The pinnacle of his career as artist and teacher happened at Umzuvele High School in KwaMashu where he taught for 20 years between 1977 and 1997. During this stage of his life, Sibisi realised an opportunity to fuse and interpret socio-political experiences of the day with his art. Since his learners were directly impacted by the unjust policies of apartheid, their activism and resistance inspired some of his work. Titles such as The Classroom Wrangle (1989), Umzuvele Unrest (1981), Love and Peace (1981), and Stop It Now (1986) emanate from this time. 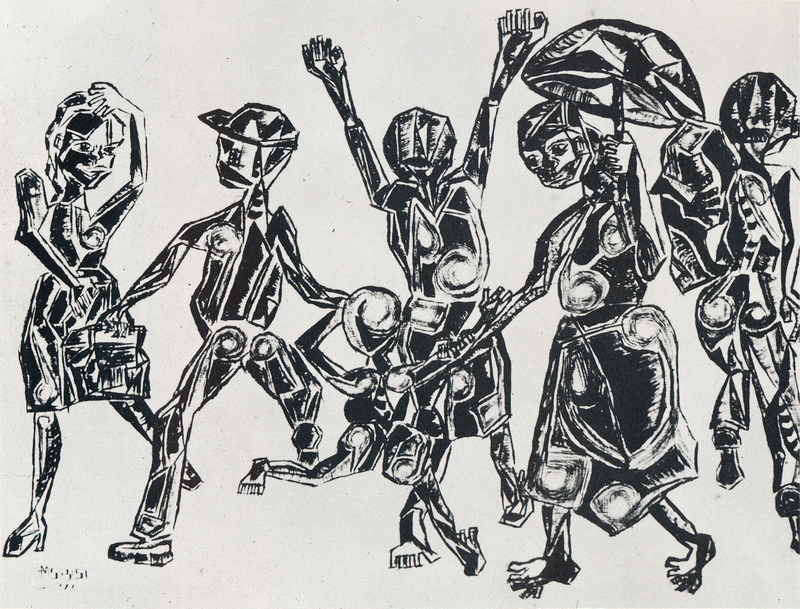 Whilst working at Umzuvele, Sibisi developed the wash-away technique inspired by etching, which was beyond his means to even consider practising at home. The technique includes him sketching the composition on Fabriano Cotton paper, followed by pen and ink to further develop the forms. Successive layers of coloured inks are blown on the surface using an atomizer spray while covering parts that he wants to retain with adhesive glue, to be rinsed away later with water. This process can be seen in the 1980 nostalgic red and yellow-dominated Myself in 1968 which he depicted from a photograph that was taken at Ndaleni. The work shows a male figure that cuts diagonally across the surface of the composition to divide it into two triangles. The portrait represents a calm and focused, youthful Sibisi with a mallet and chisel sculpting a contorted mask that is resting between his feet. The political agitations of his learners at Umzuvele seem to have emboldened him to produce some of his iconic compositions. Sibisi explored the activism and restlessness of his learners in Umzuvele Unrest I. The vertical arrangement represents chanting masses of angry black youth with raised fists and led by a female learner in school uniform. Echoes of the sounds of toyi-toyi can be felt throughout the work. Another image, Umzuvele Unrest II portrays a march by school pupils holding placards while registering their displeasure at the state of the country’s education. A limited palette of transparent greens, subdued yellows and purples against the dynamic black patterns, shadows and gestures of the singing crowds establishes a dramatic ambience. Sibisi further explores the savage brutality of apartheid in Umzuvele III. The work shows two state security men in camouflaged uniforms, one black and the other white. They are portrayed pulling and pushing a protesting black youth. Their vicious force is a reminder of the desperation that the government showed when the country’s townships were unruly. The political turbulence, which started at Umzuvele before spreading to other schools around Durban and Natal, was inspired by the 1976 Soweto students’ uprisings. During this time Sibisi was producing highly provocative interpretations of black discontent amidst the government’s censorship. Although he visited the US courtesy of the Operation Crossroads Africa Grant in 1984 and to Fircraft College in England on the British Council Fellowship in 1987, he continued as a schoolteacher. Teaching might have taken Sibisi away from his art for longer periods yet it guaranteed him a stable income, which minimised the economic hardships of being black in apartheid South Africa. Sibisi first participated in a group exhibition at Pietermaritzburg’s Metropolitan Church Hall in 1968 and had his first solo in 1981 at the African Art Centre. Among his accolades, he won the Graphic Art Award at the Black Expo during his maiden year at Rorke’s Drift. 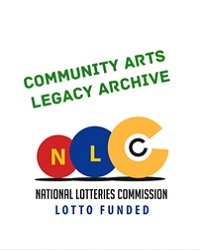 His work is represented in the Campbell Collections of the University of Natal, the collections of the Durban Art Gallery, Johannesburg Art Gallery, the Tatham Art Gallery and the Universities of Fort Hare and Zululand among others. He also penned few essays about fellow artists such as Trevor Makhoba’s Standard Bank Young Artist’s catalogue Uma Ngisaphila = As Long as I Live in 1996. 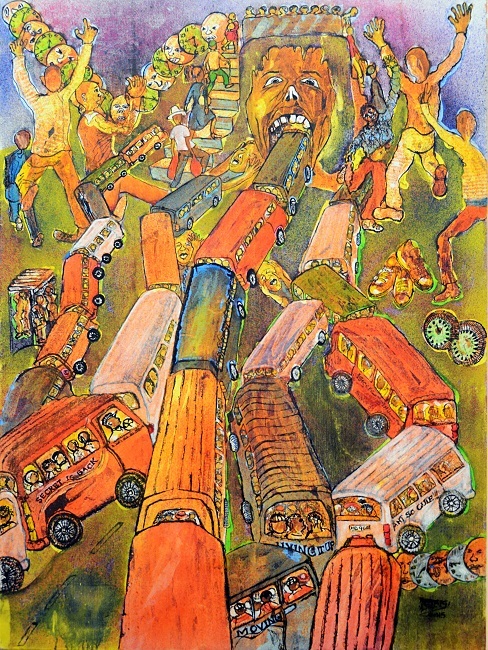 His current themes interpret public transport, music and socio-political issues in titles such as Dynamism in Transport and its People, Phansi! Phezulu! Nawe Uzonyakaza and It’s the Soil that Carries our Memories. These paintings are inspired by slogans on public transport, politics and anecdotes mined from books. Sibisi’s life and art is a stark reminder of the lingering institutional prejudice that continues to trouble the contemporary landscape. Currently, he works from the corner of his sitting room at home where he explores the wash-away technique on canvas and paper. On Saturday mornings he shares his experience, knowledge and art techniques with the youngsters of Umlazi who affectionately call him Mhkhulu. Kolodi Senong is a painter, artist and PhD candidate doing research on Lefifi Tladi. 1 Between 13 and 15 January 1949, 142 people across the races died in Durban when Zulu speakers attacked, raped and burned the properties of Indians whom they perceived as sly and exploitative (June 5 2013, Kalim Rajab, Daily Maverick – a Shimmering Resentment). Thanks for this informative article. 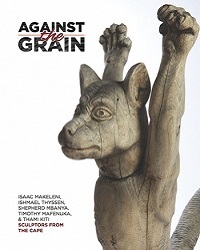 Paul is an important although sadly under-celebrated veteran of contemporary South African art. I was lucky enough to get to know Paul in the late1970’s. I was lecturing at the Durban Art School (Natal College for Advanced Technical Education). It was during the height of Apartheid and Black artists were not allowed access. Under the leadership of the late Hugh Dent a series of Saturday workshops for Black teachers was held. This was the only way we could grant access to artists like Paul. I don’t think the authorities even knew what we were doing.But we got away with it. It was during this time that I was working on a series of ‘washaway’ drawings and paintings. Paul was interested in this technique and he developed it in his own unique style. 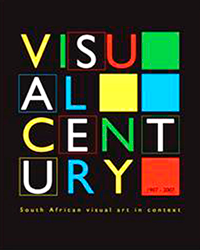 I am so glad to read that he is still making his vibrant and relevant contribution to South African visual culture.